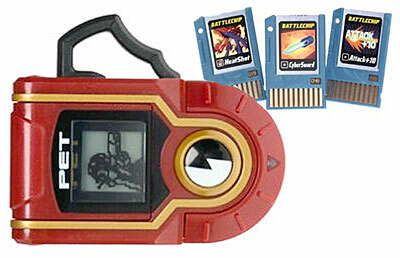 Personal electronic terminal based on the popular anime video game and the new Megaman NT Warrior cartoon series about the year 200X, the Network Age where each person carries a portable communications interface device called a PET or personal terminal, that contains an artificial intelligence program, or NetNavi, designed to navigate the worldwide information network for their respective human, or Net Operator. Be a Megaman player with your own PET. Connect with another player and load game chips into your PET to aid your NetNavi as he challenges others.